We don't know the name for certain yet, but OnePlus is the first to confirm its next phone will feature a Qualcomm Snapdragon 855 inside. 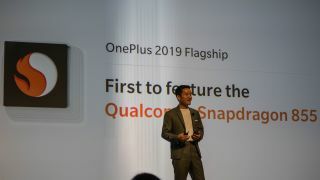 Pete Lau, CEO of OnePlus, confirmed the news on stage at the Qualcomm Snapdragon Summit 2018 and said its next mobile device will feature the newly announced chipset. Lau didn't confirm the name of the next handset, but considering the general naming convention for OnePlus handsets we can safely assume this will be the OnePlus 7. We already expected the next OnePlus device to feature the newly announced Snapdragon 855, but it's a surprise the company is the first to announce it'll feature the new chipset. Another interesting point is when we'll see the next OnePlus phone. We expected it to be released around April or later in 2019 as often OnePlus announces a new phone every six months, but this news suggests it'll be launching earlier. Often Samsung and Sony have been the first to announce it will feature the Snapdragon 855, but that isn't the case for the Snapdragon 855. We don't yet know which phone will be the first you can buy with the chipset inside though. We thought the Samsung Galaxy S10 may be the first phone on sale with the chipset, but this news may mean the next OnePlus handset is available before Samsung's next phone. Lau also confirmed the company will be the first to release a 5G phone in Europe thanks to a partnership with EE in the UK. That's set to be the same device as the one featuring a Snapdragon 855 as it's one of the major upgrades of Qualcomm's new chipset.